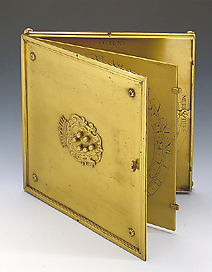 This compendium has three hinged brass leaves with sundials engraved on them. On the lid of the device is the Medicean coat of arms, in relief, and a small hole in the centre which allows a ray of sunlight to pass through to the plate underneath. Engraved on the reverse of the lid are the tables of the semi-diurnal arcs for the months of the year and the latitudes of Florence (43? 45') and Pisa (43? 28'). The central plate carries the hour disc, and the lower plate a graduated circle. The back of the plate, which has four feet placed in the corners, is also a support for a tripod. Some of the parts of the instrument are missing. Although it is unsigned, the Medicean coat of arms and the type of pointing are reminiscent of 16th-century Florentine instrument makers.